Crackin’ DJ is a DJ simulation machine where you have to scrach to the music. Your controls include 2 turntables and a fader. There are 20 songs including a lesson tune and 2 hidden songs. One of the bonus tunes is a remake of the « outrun » theme song. The « Beats » fall down in columns on the left and right side. When the beat hits the horizontal line, that is when you start scraching. The music is accompanied by animated videos that are shown in the background. The game is very « ghetto ». Most of the tunes are generic Rap and R&B songs created by « Hiro » from Sega’s music development team. 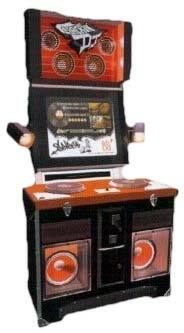 Crackin DJ was only released as a dedicated cabinet in very limited numbers in Japan. There are less 5 than Crackin DJ machines in the USA as of July 2003.